ENCINO, Calif. – April 26, 2016. 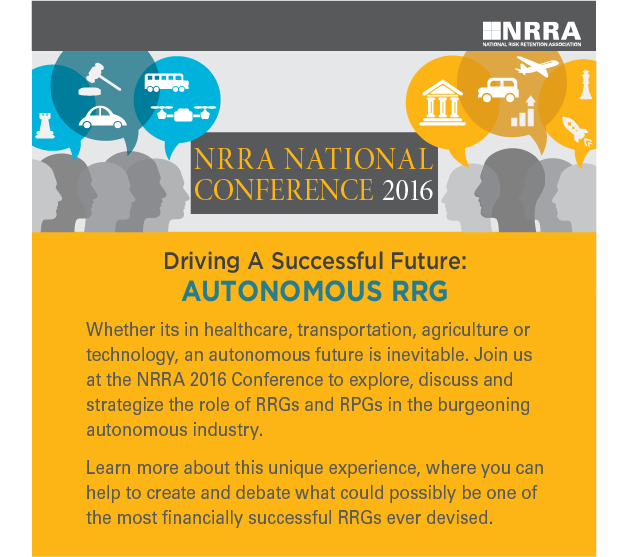 The Executive Office at the National Risk Retention Association announced today that information will be released soon on Autonomous, RRG, a virtual company designed to promote dialogue at the 2016 NRRA National Conference. Conference attendees will work together to build Autonomous, RRG by leveraging features, strategies, and programs used by companies outperforming the traditional industry. State-of–the-art risk management and other creative strategies that maximize the protections afforded by the Liability Risk Retention Act (LRRA) also will be explored. The 2016 NRRA National Conference will be held on September 27th – 29th, 2016 at the Chicago Water Tower Hotel. The conference is designed to bring together industry peers for three days of great networking, NRRA-unique, fast-paced educational sessions, an impressive slate of speakers, and the most current information about the regulatory, judicial, and legislative issues facing risk retention groups and purchasing groups today.